Album Info: The next morning. Description: This diagram shows the situation as I found it on the morning of the 28th. The second CRI&P train had been removed and the first CB&Q diesel though shown was mostly gone. Two steam wrecking cranes with their trains are present. The 27 pictures in this album are numbered and the number and direction of each picture is shown on this diagram. 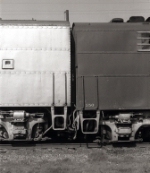 The Zephyr had three units, four stored mail cars (J), two baggage cars (B), three coaches (C), two slumber coaches (S), and a heavyweight diner (D). The headend cars accordioned, no doubt absorbing much of the impact and protecting the passenger cars somewhat. The lead CB&Q diesel jackknifed and the first Rock Island diesel took to the air. Description: Rerailing the last Ak-Sar-Ben Zephyr car, a coach. Title: Picture 03, Mustard and Catsup On Your Hot Dog? Description: The car to the left is DRG&W Diner "Silver Gorge" the other is CB&Q Slumber Coach "Silver Crag". 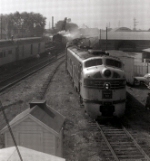 Both are California Zephyr cars. Description: 7 of 9 E-units involved. See closeup pictures for details. Description: Repaired and became BN 9987. Description: E7A 9922B was subsequently scrapped. She was 19 and obviously not worth the repair expense. E9A 9987A at the right however was returned to service. Description: This looks like the cab to the first Rock Island unit. Description: Using the "Sheep Yards" track down and through the yard and back up to the Aurora Depot. Description: First train through using the sheep yard lead track. Pieces on the ground are parts of the lead Zephyr E-unit. Description: One of the first trains through using the Sheep Yard lead track. Parts on the ground are from the lead Zephyr diesel. Description: Cab of Zephyr lead diesel. Description: First train through on Sheep Yard lead track and Zephyr Baggage car. Description: Last CB&Q baggage car and first two coaches. Description: Second CB&Q coach and two Slumber Coachs. Description: Looking west from tower (screen on window). One crane and its cars are to the left. Sheep Yard lead track is center with rods from tower to its left. Description: First train through on Sheep Yard lead track behind the tower. Description: These were called strong-arm plants and sometimes you had to use a leg too as demonstrated in this self portrait.